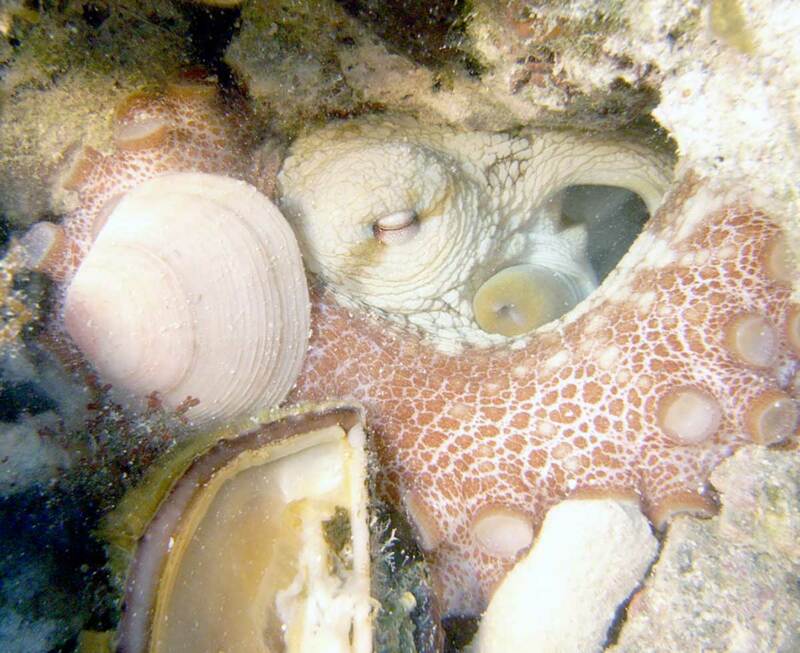 Grumpy shy octopus tries to hide in too small a hole and must resort to covering itself with shells. Octopus and squid are the most advanced of all mollusks. They are shape shifting masters of disguise. Like crustaceans they use copper rather than iron in their blood to transport oxygen. Hence their blood is a greeny blue rather than red like ours. Perhaps the inshore are my father frequented was more their environment. I see octopus very rarely and they have always been embarrassed to be noticed and unwilling to accept food. Still every now and then I will see the top part of a rock scallop on the sand and the empty sesile shell on the reef and I know we have had an eight legged visitor in the night. The one in this photo was in too small an indentation to get out of sight and tried his best to obscure himself with shells, including the mussel I gave him.